Cognitive and behavioural psychotherapies are a range of therapies based on concepts and principles derived from psychological models of human emotion and behaviour. Cognitive Behaviour Therapy (CBT) is a talking therapy that helps people who are experiencing a wide range of mental health difficulties. Cognitive Behavioural Therapy (CBT) is recognised by the National Centre for Clinical Excellence (NICE) and the NHS as the most effective therapy for a range of mental health problems. 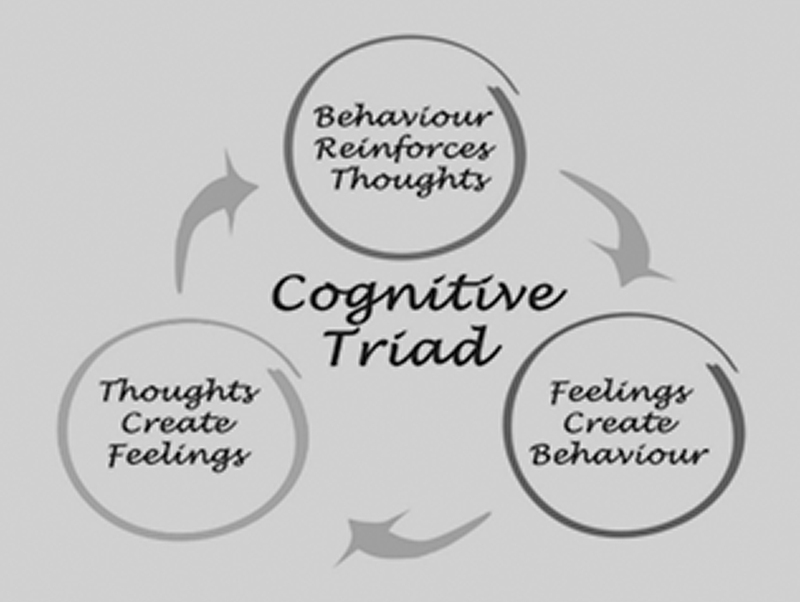 The term ‘Cognitive-Behavioural Therapy’ (CBT) is variously used to refer to behaviour therapy, cognitive therapy, and to therapy based on the pragmatic combination of principles of behavioural and cognitive theories. CBT is dynamic in that its interventions are continually updated with developments in the academic discipline of psychology in areas such as attention, perception, reasoning, decision making etc. CBT is a form of talking therapy that helps people to see how their thoughts influence their emotions and behaviours. By making links between what we do, think and feel, CBT can help us make positive changes in our lives. Sessions work on the principle that ‘we can’t change our pasts’, but we can change the way we deal with things in the present. Unlike other talking therapies, CBT focuses on the ‘here and now’ in terms of your problems and difficulties. Instead of focusing on the causes of your distress or symptoms in the past, it looks for ways to improve your state of mind now. The reason for this is that according to CBT, it’s not the event which causes our emotions, but how we interpret that event – what we think or what meaning we give that event or situation. CBT can help you to make sense of overwhelming problems by breaking them down into smaller parts. This makes it easier to see how they are connected and how they affect you. CBT is an active process where we identify the vicious cycles maintaining your problems and find ways of change things rather than just talking. It involves setting clear goals and completing tasks outside of your sessions. This means that sessions involve us both working together as a team to identify, prioritise and resolve your problems. CBT practitioners help their clients to identify and change maladaptive thinking and behaviours. The result is often a major improvement in not only how a person feels emotionally, but their quality of life overall. CBT is based on scientific principles which research has shown to be effective for a wide range of problems. Clients and therapists work together to identify and understand problems. The approach usually focuses on difficulties in the here and now and includes identifying therapy goals and strategies which are continually monitored and evaluated. CBT treatment is inherently empowering in nature, the outcome being to focus on specific psychological and practical skills (e.g. in reflecting on and exploring the meaning attributed to events and situations and re-evaluation of those meanings) aimed at enabling the client to tackle their problems using their own resources. The acquisition and utilisation of such skills is seen as the main goal, and the active component in promoting change with an emphasis on putting what has been learned into practice between sessions (“homework”). Thus the overall aim is for the individual to attribute improvement in their problems to their own efforts, in collaboration with the psychotherapist. Cognitive and/or behavioural psychotherapists work with individuals, families and groups. The approaches can be used to help anyone irrespective of age, ability, culture, race, gender or sexual preference. Cognitive and/or behavioural psychotherapies can be used on their own or in conjunction with medication, depending on the severity or nature of each client’s problem. A significant factor in the success of therapy is your own motivation and desire for change, together with a willingness to practise and use the techniques and skills I will share with you. I can support you and encourage you as I know how difficult this can be. But this does need patience and compassion which don’t always come naturally to us. What to expect from a typical CBT session? CBT explores the way you think as well as the way that you behave, and the link between the two and how this applies to you is frequently explored and demonstrated. A typical CBT session involves breaking down recent life events that have caused you distress. Together we will take a closer look at the way in which your thoughts, feelings, physical sensations and behaviours have been triggered and work out what is no longer helpful for you. The goal of CBT is to break the cycle that negative thinking creates and work on more adaptive and positive ways of thinking and behaving.